As you grow older, your blood vessels start to degenerate and become less flexible. Plaques build op on the inside of your arteries. These plaques generally consist of a mixture of white blood cells, calcium and fibrous tissue. Eventually, these plaques grow very thick. This generally expresses itself in the form of poor stamina, impotence, baldness and cardiovascular disease. Premature baldness in men is actually a bigger risk factor for cardiovascular disease than obesity. I think that an animal protein-based diet is one of the biggest risk factors for these various ailments caused by vascular stiffness. I think the “bitcoin carnivore” diet, the “paleo diet”, the “low carb” diet and similar diets are disastrous for human health, at least in the long term. One study found that 45% of people with a low carb diet reported hair loss as a side-effect, compared to 21% in a low-fat group. For what it’s worth, I think it’s a toxic reductionist mentality to imagine that eliminating one ingredient from your diet will somehow make you healthy and so I wouldn’t recommend a “low fat” diet either. Instead, the aim needs to be to have a diet as varied as possible, including nutrition from all the major food groups. The advice is summarized as following by Michael Pollan: “Eat food, not too much, mostly plants.” If you exercise a lot and stick to eating healthy plants however, you can forget the “too much” part of the advice without becoming overweight (as a vegetarian, my main hobby is eating until it hurts). The thing that I want to discuss here today, is why people suffer cardiovascular disease. The big traditional nemesis has been cholesterol. It’s true that reducing cholesterol can address the buildup of plaques, but the body uses cholesterol for a wide variety of biological functions. Cholesterol is used for example, to produce various forms of steroids and other hormones. It’s a common finding that people with low levels of cholesterol tend to suffer depression and other forms of mental illness. To artificially reduce cholesterol levels in our body in an effort to reduce cardiovascular disease is a bit like using a sledgehammer to crack a nut. It might work, but it doesn’t seem like a desirable response. Instead, the proper response is to start out by asking why these plaques emerge in the first place. The reason is because these plaques serve to address problems caused by damaged blood vessels. When the body is better capable of repairing the damage of these blood vessels, cholesterol levels tend to go down spontaneously and the accumulation of plaques is greatly reduced. Rather than being the primary root cause of cardiovascular disease, cholesterol seems to be a response of the body in an effort to address the damage caused by other factors. As an example, vitamin C is used by our body to synthesize collagen. When you take large amounts of vitamin C, the body tends to produce more collagen, our blood vessels become stronger and cholesterol levels can go down, while plaque accumulation is reduced. In a similar manner, my suspicion is that the increase in cholesterol seen in people who consume a lot of animal foods, is not due to the cholesterol contained in the food, or even due to saturated fats in general. Instead, it seems a response to substances found in animal protein itself. As an example, our body does not appear to be very fond of Neu5Gc, an aminosugar found in all mammals except humans due to a mutation we carry. When we eat non-human mammals or drink their milk, our bodies end up incorporating molecules like Neu5Gc, that are similar to our own biology but nonetheless subtly different. This appears to trigger an aggressive immune response, which may play a role in cardiovascular disease. In contrast, when scientists look at intake of chicken meat or seafood, no strong links to cardiovascular disease, kidney damage and assorted ailments generally becomes visible. My suggestion would be that the whole world needs to rid itself of its reliance on consuming large amounts of vertebrate meat on a daily basis. This won’t happen overnight. Instead dumb people will work together to destroy the Amazon forest and leave our whole world an impoverished mess. I’m not claiming that everyone needs to be vegan, there can be sufficient room on our planet for seven billion people to eat shellfish, insects and the occasional vertebrate, but consumption of large animals will have to decline dramatically if we wish to preserve a habitable planet. So what should you do, if you find yourself in the position of a middle-aged person faced with calcified arteries and probably a lifetime of poor dietary choices behind you? You might not be aware of this, but we now understand how these plaques can be gradually removed, before they cause a stroke or a heart attack. How much calcium your body takes up from your diet is regulated by your vitamin D blood levels. More vitamin D means you’ll absorb more calcium from your diet. Where this calcium is deposited however, is largely determined by your vitamin K levels. Insufficient vitamin K in your diet means your calcium will be deposited in your blood vessels. The most effective form of vitamin K, is the form of vitamin K that’s hardest to find of course. This is menaquinone, a version of vitamin K primarily produced by bacteria. The main form produced by the human body from K1 is menaquinone-4. This is also the form found in most animal products. Bacteria however often produce a form called menaquinone-7. This form is known to reduce arterial stiffness in adults, probably because it’s involved in the production of a protein involved in the prevention of vascular calcification. Another relevant substance is nattokinase, which is produced by bacteria found in fermented Japanese soybeans (natto). Nattokinase is an enzyme that’s specifically capable of removing the fibrous connective tissue found in atheromatous plaques. Recently, it was found that a dose of 6000 FU of nattokinase given daily over a period of 26 weeks reduces the carotid plaque size by 36.6%, compared to just 11.5% in people given statins. 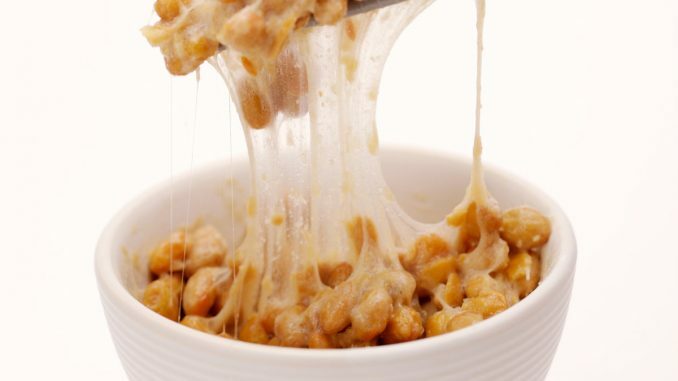 It’s thought that one portion of 50 gram of Natto contains 1,400-2,000 FU of nattokinase. In addition to this, the bacteria in Natto produce 1,034.0 microgram of vitamin K2 per 100 gram, the highest amount found in any food substance known to man. So, if we consider that the Japanese eat a lot of Natto and relatively little red meat, the near absence of cardiovascular disease in Japan begins to make sense. The Japanese smoke twice as much as the Americans do, have higher blood pressure and higher cholesterol levels, but seventy percent less cases of cardiovascular disease. The article I link to here suggests it’s due to their consumption of fish, but a big candidate in my opinion would be Natto. A study from Japan found that although soy alone has no relationship to cardiovascular disease risk in the Japanese, Natto consumption does, as those who eat the most Natto have the lowest risk of cardiovascular disease. My suggestion to people would be to consume some traditional Japanese Natto from time to time, to prevent cardiovascular disease. I’d be pleasantly surprised if I have any readers above the age of fifty, but if you’re at high risk for atherosclerosis, my suggestion would be to eat Natto, but also to take supplemental Nattokinase. A month’s worth of Nattokinase can be bought for 21 Euro on the Internet. I’m also going to shamelessly shill here for a local Dutch Natto producer (despite not getting a penny from it myself), a man who reversed his own atherosclerosis by consuming high amounts of Natto on daily basis. His website can be found here. He uses a specific technique that involves mixing the beans with some grains, to greatly increase the bacteria’s production of Nattokinase. Now I’m sure there are some guys out there who will say that soy turns you into a soyboy beta cuck. To them I would suggest that spending your free time reading 4chan and other mediocre website turns you into a soyboy beta cuck. No wait, reading such mediocre websites leads you to create a meme-manifesto, shoot up a mosque and spend the rest of your life in jail. In reality, soy, particularly fermented soy, is a culinary tradition found throughout Asia that contributes to optimal health and longevity. I would recommend people to eat some raw Natto, some Chinese stinky tofu, some Indonesian Tempeh and various other forms of fermented soy found throughout the orient. If you’re really fearful of soy, I would be curious to see anyone attempt to use the bacteria found in Natto to ferment other beans.